Fans of LEGO Star Wars Clone Wars rejoice, there’s a new set of clones in town. Gone are the plain, white troopers and clone gunners of packs past. 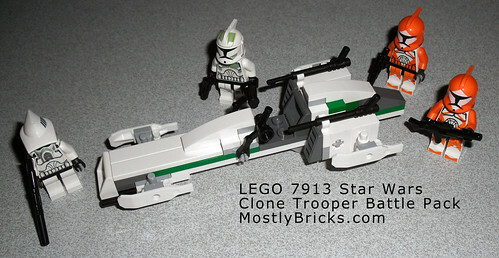 The 2011 LEGO Star Wars Clone Trooper pack is here, it’s more colorful, has a new figure (the ARF trooper), and the set’s vehicle is pretty nice, too. This is another early bird set offered through Toys R Us online, and also in the retail LEGO Stores. 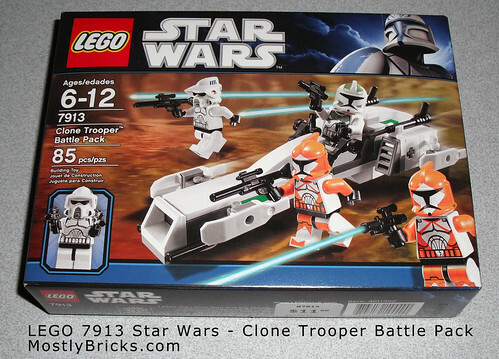 This battle pack comes with 85 pieces which includes four Clone Trooper minifigs. It retails at the LEGO Store for $11.99. Toys R Us offers this set online for $14.99. I was able to use my LEGO VIP points on this (and the Mandalorian Battle Pack), so I got it for a little under half the price! The LEGO VIP program is very handy, especially when buying the new stuff no other store has. So, what did I think about the set? As with the Mandalorian Battle Pack, this set is tops with me. I think it’s almost as cool as the Mandalorian battle pack that was just released. 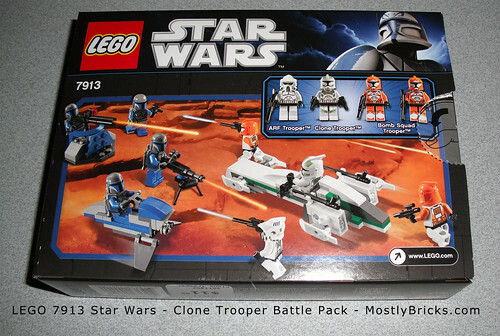 This is a better set (than the last clone trooper set) based on the fact that it’s new (finally, a new one), and I’m really liking the different colors, and the the new vehicle more than the before-mentioned plain white troopers; and that dinky little walker they came with in the last battle pack edition. The speeder bike has many good parts for MOCs should you decide to buy a ton of these, and have a bunch of speeder pieces left over. Everything from skis/skids to harpoon guns, and green bricks make up the speeder bike along with other useful parts. You get four minifigs here. 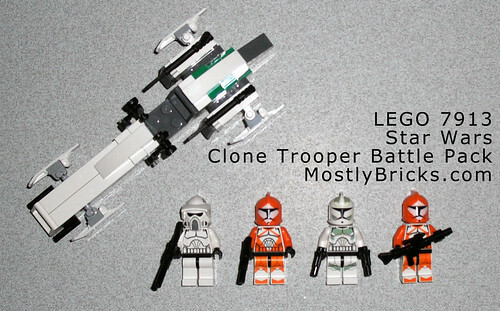 Included are one ARF Trooper, one green decorated Clone Trooper, and 2 orange clad Bomb Squad Troopers. My favorite is the ARF Trooper, because he has a biker scout styled helmet. The ARF helmet has green higlights that match the ones on the green clone trooper’s armor, so you could (if you really wanted to) buy multiple packs, and mix and match the ARF helmet with the green Clone Trooper’s body. Both green’s match. As far as weapons are concerned, this battle pack is almost the same as with what came with the Mandalorian set: 2 quickdraw pistols, 2 long range rifles, and one short range rifle. Before I wrap this section up, I forgot to mention that for those of you who don’t know what ARF means, it stands for Advanced Recon Force. Rounding out the set is a cool little speeder bike-type vehicle that is way cooler than the walker. Instead of the troops trodding along at a snail’s pace, I mean, a walker’s pace, the ARF Trooper can race to a good vantage point to spy on enemy positions before the rest of his team gets there. Pros of this set would definitely be the ARF Trooper helmet, and the colors on the other three figures (since the ARF Trooper armor is standard white Clone Trooper armor). The few cons I have with the set are that some retailers who already advertise themselves as having this set, are overpricing it by 2 to 3 dollars. The other con I have is more of a personal one, and that’s the ARF Trooper. I would have rather had 2 of these guys than 2 orange Bomb Squad Troopers mainly because I’m going to have way too many orange troops after I buy a bunch of these. Somehow, after I eventually buy ten packs, bomb Squad Troopers won’t be so unique at their specialty of defusing bombs when there’s TWENTY OF THEM!!! A minor complaint that I am sure will arise is the lack of extra pieces. This set only had one extra piece, and that was a robot arm part (the part used as a handlebar on the speeder). Anyway, this set is the perfect companion to the Mandalorian Battle Pack, but I’m sure the Mandalorians will wipe the floors with these guys while they’re busy doing recon work and defusing LEGO bombs.